Where Are The Twins Getting It Wrong? 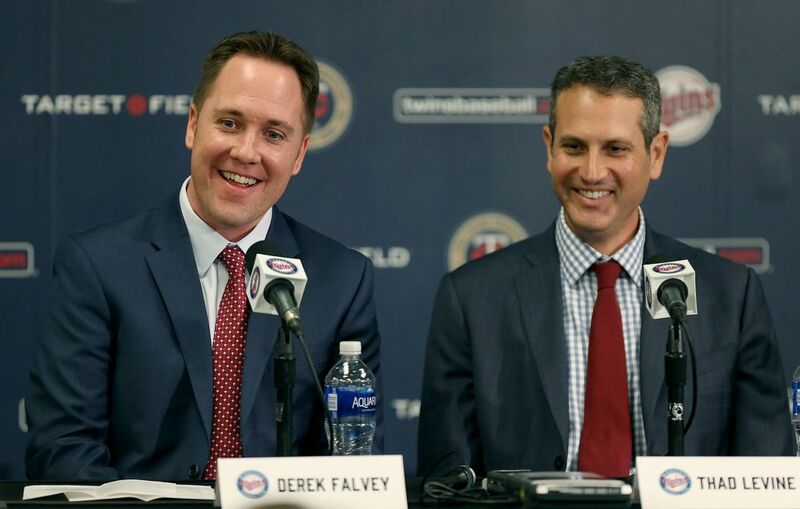 The rebuild of Minnesota's front office started in autumn of 2016, with the hirings of Derek Falvey and Thad Levine at the top. It progressively continued after that, with additions and swaps throughout the regime, and nearly two years later the Twins have a very different look. The end goal of this overhaul was clear: Bring in new ideas, fresh thinking, modernized evaluation. The Twins wanted – and needed – to reach the sophisticated level of fellow small/mid-market franchises like Tampa and Oakland, which manage to overcome their inherent restrictions and succeed beyond expectation. Yet here in 2018, with their new baseball operations department settled in, the Twins still find themselves lagging behind. What gives? No one made much of the Rays or Athletics this spring – ostensible rebuilders in extremely tough divisions. As we enter mid-September, though, Oakland is nipping at Houston's heels in the AL West, while Tampa remains relevant in the wild-card standings, 14 games above .500. Meanwhile, the Twins are hopelessly out of contention, potentially headed toward another 90-loss finish. Despite being tailored largely to the new front office's specifications, this team never really mustered a threat in an historically bad division. Highly favorable circumstances and a record payroll couldn't save Minnesota from almost front-to-back irrelevance. Once again, we Twins fans are left to look longingly at the Tampas and Oaklands of the world, and wonder why their success continues to elude us. It's not like those teams have been without setbacks. The Rays lost top prospect Brent Honeywell, verging on MLB-readiness, to Tommy John surgery in spring training. Jose De Leon, too. The A's rotation has gone through the wringer this year – they're rattling off wins these days behind a patchwork group that includes a resurrected Edwin Jackson. These scrappy, savvily constructed teams are simply rolling with the punches, getting it done, hitting all the notes Minnesota seems to miss. The Twins are trying their best to imitate some of the rising trends being championed by these innovative franchises. We've seen them follow in Tampa's footstops with the "Opener" strategy a few times, albeit with dismal results. A noted pitching guru, Falvey has implemented new methods and helped lift Minnesota's strikeout proficiency from the deepest dregs, but the overall results have been customarily mediocre. Like the A's, we've seen the Twins eagerly embrace the launch angle revolution – they hit the second-highest fly ball percentage of any team in baseball behind Oakland – but like its pitching staff, Minnesota's offense has been lackluster, paling in comparison to the contending units they are supposed to be challenging. The inferiority of this club was thoroughly evident last week when they were dismantled by the Astros. The same has been true frequently when Minnesota has faced off against top-tier teams. In general, I think it's tough to knock the strategies deployed by Falvey and Levine since taking over the Twins. They've been opportunistic with player acquisition, making a number of smart future-focused additions, and they've undeniably killed it with both their first two drafts. The new top execs have also populated the ranks of Minnesota's front office with plenty of sharp, respected pros. But something isn't clicking. Why does Ryan Pressly only fully unleash his curveball and reach his potential upon departing Minnesota for Houston? Why do Twins pitchers and hitters continue to struggle with adjustments, experiencing endemic regressions? Why are this team's weaknesses being exploited so much more often than the reverse? There are several theories. One is that the shift to an analytical focus has been too extreme. Terry Ryan was the ultimate people person, and that has underlying value. Falvey and Levine are friendly and engaging guys, to be sure, but their style of management could only be described as cold and calculated. They shuttle players in and out from the minors with total abandon. They took Kyle Gibson to arbitration – a step the Twins haven't taken with a player in more than a decade – in their first full offseason at the helm, almost as if to make a statement. These intangible, relationship-based factors are almost impossible to analyze, but it's foolish to ignore them. The 2018 Twins felt in many ways like a mercenary gang – heavy on one-year contracts, light on long-term commitments – and the Buxton decision seems to epitomize this "all business" mindset. The human element does matter. TR's teams in the early 2000s were consistently greater than the sum of their parts. This year's club never seemed to gel. Maybe there's a disconnect somewhere. As much as Falvey talks about fostering a collaborative culture, he has radically shaken up a firmly entrenched organizational structure. He is also channeling his agenda into the clubhouse through a manager he inherited, and whose merits have hardly been proven on the field. This all brings us to what is in my mind the most likely, and least concerning, scenario: it's all still coalescing. October 3rd will mark the two-year anniversary of Falvey's hiring. And his ranks as a lengthy tenure in a franchise that's seen unprecedented churn. I believe in him, and Levine, and what they're building. I do believe that the first two problem areas discussed here – misalignments at both the human and organizational levels – have substance, and need improvement. But I also think both are natural byproducts of the circumstances before us: a cerebral 35-year-old thrust to the top of a major-league baseball franchise for the first time, with a second-year GM still acclimating to the head role. Some might disagree, and I'd be curious to hear your thoughts in the comments, but from my view, the front office shortcomings of 2018 can be chalked up mostly to growing pains. As we head into Year 3, it's time to regroup, look inward, and get these issues ironed out. A critical offseason lies ahead. (1) Seeing what you have. They inherited some fine young players. The big two stepped back from okay 2017 seasons, sadly. They might be holding back on a few others, thinking the end of their five year rebuild plan. (2) 2017 was an oddity. They needed to put butts in the seat. Thoughts were given to striking big with a major contract. Instead, they settled on a few modest signings which should've worked out. I had no problem with the off-season moves. In the central division as it is, the Twins should've been competitive. But with their "prospects" slumping and their free agents doing nothing, they did a sell off which will probably payoff bigtime down-the-line. Mark my words. Now they get to do Year Two all over again in Year 3...giving another chance to Sano and Buxton to start to shine. They will look at Gonsalves, Stewart, Littell and others to become mainstays. They have some arms in development for the bullpen. Yes, there are lacking holes in the batting order and you either give a chance to unproven folks (Gordon) or bring in some temporary help. Joe Mauer still remains a question. What does he want compared to what the team offers is the question. Can't wait to see how the market might play for Joe (aand Dozier and Escobar and Santana). I would be happy and content that the Twins try and trade some excess minor league talent for someone like (or a tad better) than Odorizzi who they can control, or just push prospects. The minor leagues did pretty darn good. Yes, it was the lower four levels. The upper two, one filled with minor league AAAA guys mostly, struck out. I hope they advance and play their own prospects more than filling the rosters with other team throwaways. They have the bodies right now, adding a dozen more than expected in the season. The Big Question: Field Staff! Who do they choose. Don’t know if I can agree with that. From what has been publicly reported, a handful of guys were shuffled. Another handful let go. I’d call that rearranging deck chairs. If there is some information available as to how many (and what percentage) of player development and scouting personnel were let go, I’d be interested in seeing it. Until that evidence is shown, as far as I am concerned it’s the same people in the trenches making the same decisions just with a new boss. Frankly, Ryan made a lot of changes when he came back in 2012 - nearly all minor league coaches are from 2012 or later. Brad Steil came in to run the minors and we saw him be much more aggressive in mid-season promotions. I tend to think the problem isn't really on the minor league coaches/development people. Something isn't clicking on the ML side of this. I still think Molitor is the biggest issue. I'm not sure what it is but we've had a couple seasons now where Molitor's team seemed completely unprepared for the season. I'd like to see a different kind of manager with this core of young players. As to the FO, I agree a lot of things that they did on paper makes sense but many haven't worked out as well as they should've. I'm not sure that means they are doing good things but I can at least understand most of their moves - Logan Morrison is a cheap buy, has good LH power, let's get him. Makes sense, didn't work. Reed is a good young arm with some success, let's sign him. Makes sense, he's not good. In fairness, that article about Pressley doesn't suggest the Astros fixed Pressly.Alston is specifically credited for getting him to use it and pushing him to keep using it. Frankly, I think most of these issues still stem from the state the franchise was in when these guys took over.Two years is not a lot of time.Luhnow didn't rebuild in two years either. Probably time for a new younger manager. I'm not sure Mollie is a bad manager but I don't think he's a good one. His results have been bad and /or just barely mediocre. When your best is mediocre it's time for a change. You can't just judge them on two years, in my mind you need to give them five years. Then bring outthe pitchforks. But give them five years. Give them five years to bring in their players, coaches,processes, etcanything less than that is just a knee jerk reaction. Yes, lots of questionable decisions but who knows better, execs close to the team, execs that have worked for years in baseball, or a bunch of internet jockeys??!!!! The FO only inherited Molitor for the 17' season. They signed him to a 3 year extension after that year. Whatever role he plays in this mess can't be viewed as out of the hands of this FO. It all goes back to Sano/Buxton not doing much this year. Polanco missing a half season. Santana and Castro being hurt 90% of the year. Etc. I definitely think that the Falvey/Levine combination will be just fine. They just need more time. They've done a lot of good things. Terry Ryan was very present. It was important to him that the players knew he was around, and they knew he could be communicated with, etc. He spent a lot of time at the affiliates. It's a completely different culture. Even if some of the names are the same. There have been a lot of guys let go (front office types, scouts, etc.). Some have remained but the culture is completely different. It's all business.. and that doesn't have to be a bad thing. I keep wondering if we just simply experienced a confluence of factors that contributed to the malaise, and that fewer things were "done" wrong and more things just "went" wrong. I see some things that need to "coalesce".I see a couple more things that need fixing, starting with a replacement of Molitor. Many of the talent evaluators are holdovers, and that's good, as evidenced by a number of successful drafts, trades, international signings, etc. I don't see that this skill is a weakness, and it might be a strength, especially now that the human talent has been augmented by technology, systems, and analytical support. The organization really beefed up its baseball operations big time. We might want to give it another year to start reaping dividends. I'll continue to contend that the FO should not be on the hook for the colossal failings of Sano and Buxton, which I attribute mostly to just plain unforeseeable bad luck. And it's those two huge disappointments that dwarf any other contributing factors to the horrendous results we're seeing in 2018. There may be some personnel improvements that can still be made in the development ranks and in the field staff of affiliates, but I see coaching leadership at Target Field as a very likely culprit. So, MLB leadership, luck, and more time to gel, in that order, IMO. I think it's a good, even-handed take. However, I personally am skeptical of the "sustainability" talk, particularly if what Seth says is true about their cold personalities. I am neutral on Molitor. I don't think Molitor is a good fit for what they want to do, but then again, I'm not sure what they're doing will work without him, either. Bringing in a different manager might make the coldness problem worse, because despite Molitor's flaws, he at least has relationships with these players that go back years. I'm afraid to find out who they think would be a good person to hire in his place. And Molitor also has a relationship with the city and with ownership, like it or not. Welcome to the top, fellas! Tough decisions must be made. Seth, some of this might be true, but all business is not an end all in the baseball business.Players must know you care for their welfare and are interested in bringing out their best.If their best is not good enough, most of them will understand they tried and did not succeed. If you make it all business, you risk the players that do succeed being alienated from the club and if they feel like a number, they will leave as soon as they can.Example, if you play for Oakland or Tampa Bay, you most likely will be traded before you hit FA, therefore your loyalty to these clubs is likely to be less then to a successful club that your are a part of.Just do not want the Twins to become like a farm club, where most of your better players decide long before FA that they do not want to be part of the long term future of your club. It worries me along with other posters, that many of the Twins players traded or released the last couple of years (or left in minor league FA), have become much better players with their new clubs.That seldom happened in the Terry Ryan era We already have seen this with Pressly and Derek Rodriquez, two pitchers who should have been part of the Twins future. We also need to sign the building blocks for the future.None of us know the details, but am disappointed that none of the young Twins have been signed to long term deals. Romero and Berrios are a must this offseason, and I wonder what they offered Escobar that was turned down(reported by the local papers here), before he was traded. I wonder if some of the offers were extremely team friendly and what damage that might have done in the long run. We also need to sign the building blocks for the future. None of us know the details, but am disappointed that none of the young Twins have been signed to long term deals. Very inciteful. I also wonder if one would have signed, others would have followed. In fairness, that article about Pressley doesn't suggest the Astros fixed Pressly. Alston is specifically credited for getting him to use it and pushing him to keep using it. Frankly, I think most of these issues still stem from the state the franchise was in when these guys took over. Two years is not a lot of time. Luhnow didn't rebuild in two years either. The entire Twins organization (Manager, Coaches, Catchers) NEVER figured out HOW to use Pressly. Just look back at how his pitches were called when he was with the Twins and how his pitches are being called in Houston. In Minnesota, was it that he shook off the catchers or that he didn't shake them off when he should have? As I remember it Pressly hung a lot of breaking balls here, it seems that was fixed in Houston.In the FO defense, one of the best new prospects in the Twins orgainization, came from Houston in the trade. Pressly was pretty good for the Twins this year. That's why they got some good prospects by trading him. I was ready to give up on him multiple times over the years, but he is a success story--for both FO regimes. He looks even better when he's pitching for the best team in baseball. Change is hard, and the TR era culture was long-standing and perhaps unique. Perhaps a final house cleaning of veteran players from that era will help transition away from guys pining for the good ol days. I don't see the angst over the trading deadline "sale". We weren't going anywhere, and as we may have noticed there is nothing in Rochester that indicates we are going anywhere next year either. Any talent, if it exists is south of there. There are things that can't be controlled. Injuries, sadly suspensions, and unexpected slumps. These happen to everyone. The issue is what do you do when they happen, and the season is lost. In some aspects they did fine, get what you could for expiring contracted players. But after that you need to use the time to find out what you have, and what you don't. Polanco to me is an example of how not to do this. Once Dozier was gone it was time to move Polanco to second base and let anyone, even Giminez, , play SS. You already know Polanco can't, so you have to find out if he can play second. Garver is another example. WAY to many wasted innings with Wilson and Giminez. These things seem obvious, at least to me. What isn't obvious is who is responsible? Molitor? Or the FO? Something just seems amiss in the coordination of the roster, and the on field playing time. One last thing. Teaching "launch angle" style hitting to players who don't have the natural power to hit the ball consistently into the seats is senseless. I would guarantee it ruins as many hitters as it improves. I think Kepler may be a good example. Count me among those that believe they haven't done all that much wrong.The problems leading to this year's failure are the result of bad luck, lack of performance by several critical parts of this team, a bad decision by their shortstop and a failure by most of the free agent signings who all looked good on paper. I hope they don't make too many radical moves this coming off-season.Rather, they should focus on signing a few of their in house youngsters, Berrios, Rosario and Gibson...well, Gibson isn't young anymore.Then sink or swim next year to some extent based on whether or not the two super prospects, Buxton and Sano, perform.If not, going into 2020 write them out of the plan and move on. They also need a second baseman.Go get Eduardo back should take care of that.As for the on field staff, agree that there seems to be something missing and a change might make sense. I continue to be frustrated with this front office and when I look at yesterday's lineup with Petit and field and a number of other players we do not want to have when was once we challenge for a playoff. Development and transition of minor Leaguers into major league players is not adequate and any measure. September supposed to be a month where we see the future and considering that idea this isn't a good future I'm not happy at all with how the September call UPS have been used and who they are. I believe these front office leaders have a long way to go to get belisle off the resume. The organization doesn't care about the players? The organization under the new regime looked at what happened last year and, in the off-season, rewarded the team by going out and spending money on free agent acquisitions, which, from I read, was greeted with enthusiasm by the clubhouse. Something the FO has been loathe to do in the past. Yet, the players brought in by Ryan didn't respond and step up. Also, key players, players that were brought in by the previous FO, have struggled at the MLB level. Sorry, this whole, "the organization doesn't care about the players" crap is another way to avoid the obvious: The players on the field aren't getting the job done. They also created a bunch of new positions as well. Orgs don't turnover well when they fire everyone, and I'd argue that there was plenty of good talent in the org, it just wasn't used well. I think a radical shakeup is accurate. I wouldn't be surprised if there's more shaking up this offseason either. Like it or not, transforming a culture doesn't happen overnight. I can tell you one place where they're getting it wrong: take a look at the current 40 man roster, two years into their tenure. Arguably worse than at any point in my lifetime. And none of what young talent they do have has been signed to a long term contract. Not one single player. Maybe they've made improvements behind the scenes, but you'll have a hard time convincing me it's made any positive difference to date. And maybe they have a strong lower minor league system. We've had that in the recent past, too. And as Twins fans, nobody should have to tell us a strong lower minor league system isn't a guarantee of anything. It's only been two years, I get that. And they weren't handed a healthy organization. But it's reasonable to conclude the organization is in worse shape now than when they took over. The human aspect of the job seems to be the thing Falvey and Levine struggle with the most. Minimal to no communication with key organization players past and present. Ignore your personal feelings about these players... They did not speak to Dozier about an extension or his future with the team. They did not speak to Mauer about his opinion of getting traded or not. They did not speak to Buxton about their decision to send him home for the season. Most decisions they've made so far is for the benefit of the organization, and Pohlad's wallet. It's not like they've done anything beyond the rules set in place. However, they don't sound like people I would personally want to report into. I want to feel like a real person, not an ant in an ant farm. → Article: Where Are The Twins Getting It Wrong?